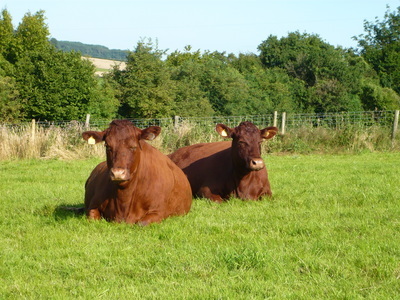 The ancestors of our domestic cattle ranged over grasslands. They were mobile, and lived off grasses, herbs, leaves and scrub. So we always believed that cattle should be raised, as far as possible, outdoors and off pasture. The more we have learnt, the more convinced we are of the importance of pasture feeding, for the whole life of the animal. We have also learnt a lot about what well managed pasture can do for the environment. So what started as a common sense approach has become a committed and researched philosophy. 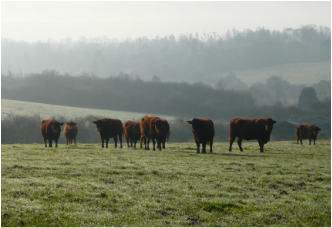 ​We talk about pasture fed meat, rather than “grass fed meat”, because good pasture is full of herbs, clovers and other plants. This variety is good for the cattle and for the flavour of the beef. It is also good for the environment. Diversity in the sward encourages diversity in the soil, insect, bird and animal life associated with it. Our cattle graze pasture for most of the year, and in the winter they receive haylage made off our fields. 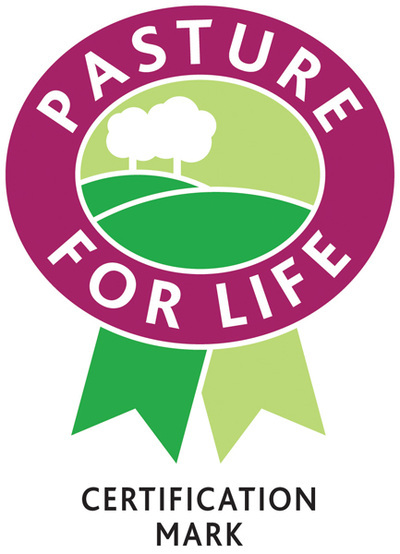 Pasture fed beef has been shown to be lower in saturated fat and higher in Omega 3 fatty acids, CLA and vitamins B and E than grain and soya fed beef. Red meat gets some bad press for being “unhealthy”. But increasingly we are seeing that this bad press relates to grain fed beef, which has a higher ratio of “bad” Omega 6 fatty acids. It also relates to the sheer volumes that some people eat! 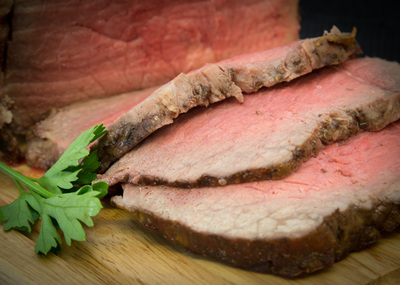 Like most good things, red meat consumption should be kept in balance. 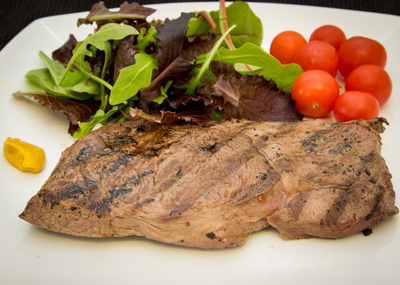 Pasture fed beef (eaten in sensible amounts) brings all the obvious benefits of beef such as protein and iron, with the further benefits of a good ratio of Omega 3 to 6, and a higher vitamin and mineral count. It really is good for you. To get these benefits the animal must have been fed off pasture for its whole life. Some producers will say their cattle are grass fed, because they spent some of their life in a field. But if they use grains and soya to fatten (“finish”) their animals then the composition of the meat changes and the health benefits described above are quickly reversed. 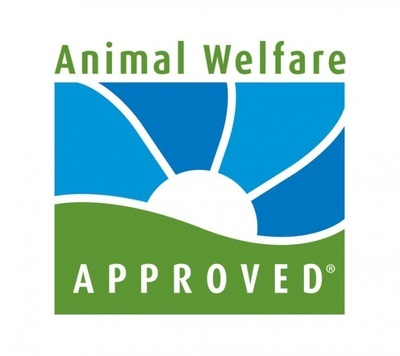 We are certified members of the Pasture Fed Livestock Association, which means that our livestock are independently verified as meeting the Pasture For Life standards. Find out more at www.pfla.org.uk. The digestive system of a cow is designed for pasture. Grass, herbs, clovers and other leafy matter. 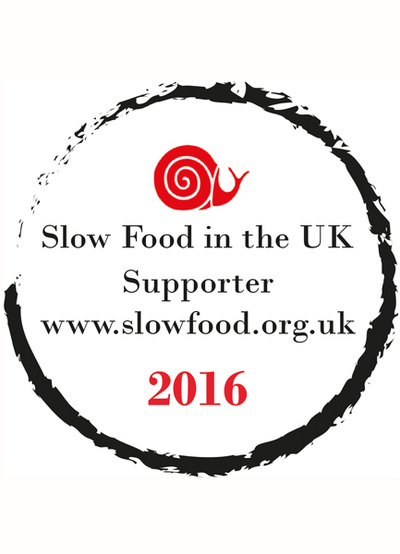 When they eat this they have “happy guts”: they look and feel better than when they are fed a concentrated cereal and soya diet. 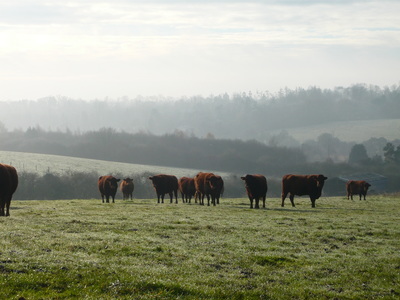 ​Firstly, well managed pasture is an environmental asset. Grass itself supports many insect, bird and animal species, providing food and habitats. But even more importantly the soil underneath a well-managed pasture should be well structured, high in humus, and teaming with insect and microbial life. This is a good thing in itself, and also means that the soil can play the part it should in a drainage system (holding water) and as a carbon sink. Secondly, intensive cereal and soya production is arguably bad for the environment. The methods and scale of global production use large amounts of chemical fertiliser, pesticides and fossil fuels. The product has to be processed and transported, requiring more energy and water. ​Thirdly, people can eat grain. It is more efficient for a person to take their nutrition straight from grain, than via a grain fed cow. But people can’t eat grass. Many parts of the world grow grass very readily, it does not have to be forced (unlike intensively produced cereals). Britain is one of those places. So by eating pasture fed meat, we can get nutritional benefit from what our ground wants to grow.